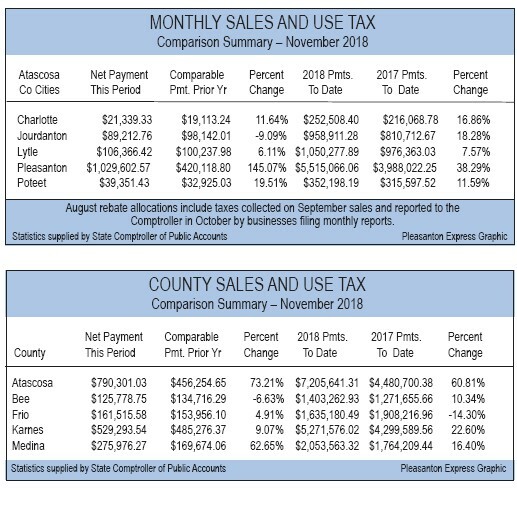 All Atascosa County cities with the exception of one saw an increase in sales and use tax payments for the month of November. Jourdanton’s sales and use tax allocations dropped -9.09 percent compared to last year. The amount paid this year was $89,212.76, down from $98,142.01 in 2017. The remainder four cities in the county saw steady increases with the exception of Pleasanton who showed a surmounting increase this year compared to 2017. Pleasanton saw a 145.07 percent increase for a payment of $1,029,602.57. That amounts to over half a million dollars more than last year’s payment of $420,118.80. 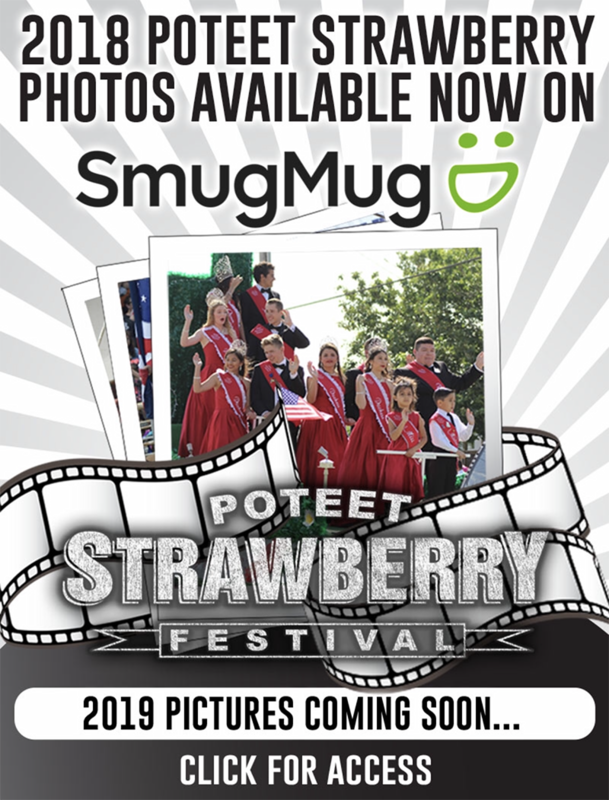 Poteet showed the second largest increase of 19.51 percent for a payment of $39,351.43. Charlotte had an 11.64 percent increase for a $21,339.22 net payment. Though small, Lytle still showed more of an increase than Jourdanton with a 6.11 percent increase for a payment of $106,366.42. Texas Comptroller Glenn Hegar announced on Nov. 7 he would send cities, counties, transit systems and special purpose taxing districts $817 million in local sales tax allocations for the month of November. 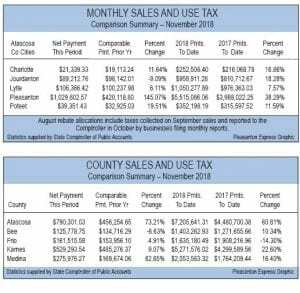 The amount is 5.4 percent more than the local sales tax allocations distributed by the comptroller in November 2017. Allocations are based on sales made in September by businesses that report tax monthly and sales made in July, August and September by quarterly filers. Compared to the surrounding counties of Bee, Frio, Karnes and Medina, Atascosa County showed the largest net payment for November. With a 73.21 percent increase, the county received a payment of $790,301.03, up from last year’s payment of $456,254.65. You can see full numbers for all cities and surrounding counties on the accompanying charts.